Deep dive into a challenge you’ve identified and co-design meaningful solutions. Learn creative thinking and service design techniques you can apply to other challenges. Validate the problems worth solving and create meaningful solutions and an action plan for how to implement. 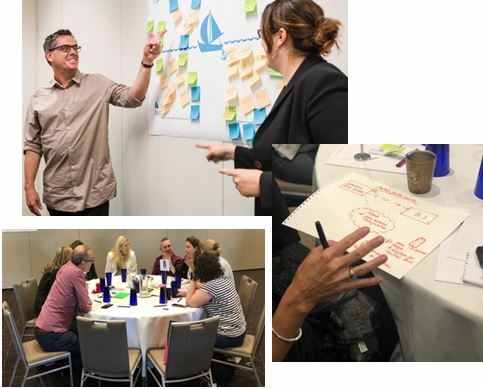 Receive a personalised session for your specific needs, utilising data insights from reports, for your team to identify and validate challenges and develop meaningful, actionable solutions. Get in touch to find out how we can co-design an improved future for your organisation. 60-90minute premeeting to identify and target activities and desired outputs for the session. Design of a personalized full day workshop session tailored to your needs. All materials for the workshop. A detailed post session report including all output created. An action plan toolkit to support you to implement the idea into practice. Industry4.0 is changing many sectors – health included. Understand the challenges and opportunities this creates specific to your organisational needs as we validate the problems worth solving and co-design meaningful, measurable and importantly actionable solutions. Deep Dive Design sessions, provide the next step for organisations that have identified a problem area or opportunity from the evidence provided within the reports and data insights and wish to “deep dive” using proven design thinking, service design and behavioural science methods to co-design a solution that will best fit the particular needs, culture and dynamics within their organisation. Data Science is a fantastic tool for capturing, analysing and presenting key findings from the various streams of data generated within an organisation, but what do you do with the problem that’s been identified? You could seek to implement one of the improvements/innovations that’s been actioned by another organisation that you’ve identified at one of the improvement groups – however you need to understand the differences between their organisation and yours in terms of community, structure, funding, processes and culture and in turn, how that impacts your ability to action that within your organisation. A personalised Deep Dive Design Session can support you to do that. You may not know how to solve that problem, or be struggling to convince funders that it is indeed a problem worth solving (and in turn investing in solving), service design and behavioural science techniques can support you to validate the problem you have identified and provide the information in a “digestable” form to present to funders to gain support to implement an innovation/improvement. You may have a complex challenge of which there is a range of solutions or perhaps a range of potential impacts of the various solutions and a Deep Dive Design session can help to work through those ideas and journey map the various options to provide a tool to step through and understand impacts and determine the way forward. Health Roundtable is pleased to be partnering with codesain to deliver this new service for members. codesain was founded by former Digital Health Agency Executive responsible for Innovation, Strategy and Development, Rachel de Sain, and provides design, strategy and innovation services to the health sector. Preparing for a changing future of how we deliver health in Australia and New Zealand. We see a radical shift coming to the health sector as the funding model is changing from a fee for service to a fee for outcome. As such organisations are wanting to better understand how to trial new solutions that lead to better outcomes to protect their funding for future service delivery. “As we see the shift from fee for service to value based pricing, organisations that are on the front foot in understanding the drivers that create or reduce value in outcomes, be it for patients, workforce adoption, operational efficiency will be the ones that succeed.” Says codesain CEO Rachel de Sain. There is also a lot of talk and in some cases fear and confusion about industry4.0, the automation of certain jobs and tasks and the push to “digitise” lots of processes and activities. Understanding what this means and to see technological innovation as a means to improve workflow and support staff to get away from the screens and keyboards and back to patient care. As health organisations face increasing changes brought about by industry 4.0 there are enormous opportunities to utilise technology to deliver improvements not only for patients and the population at large but for the workforce and broader organisational needs.